The Hurricanes won again today so hopefully they are back on track. In fact we watched 3 games of rugby this afternoon but I did wind silk yarn into hanks and finish the knitted strap and edges for my knitted embellished bag so did no waste my time. I also did some more finishing off of the book so we are getting closer to it being a real thing. I have done some more using the dragon's breath ink and iron gall - this time on tissutex. I painted acrylic wax over the top but it didn't react at all. I have pleated the tissutex (I have one to play with for the embellisher) and will think about how I might use it. I also found a wonderful poem entitled Dragon's Breath. Just enough time for a little play with a couple of things my dragons breath and iron gall inks arrived yesterday and I simply had to have a litle play. I saw Purple Missus's wonderful samples and this is a poor start but what else can you do near midnight? 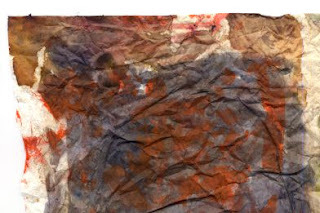 This is crumbled tissue paper with both inks painted on the surface and the potential for rusted and aged is so tempting. I will be playing more on different surfaces. 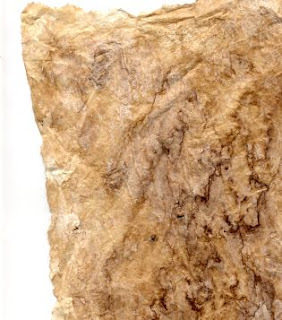 This time I have crumbled tissue paper and smeared paper perfect in places and sprayed over with walnut ink. It looks great on both sides. More exploration here too. This is instead of doing my couching samples but that is tomorrow before the next stitch. We are soooooo busy but will be caught up by Monday. All of the Quilting Arts 26s have gone out thank goodness. when I put 'the art of embroidery' up on my blog, someone emailed to tell me about 'the art of knitting' so of course I had to write off and get this one. 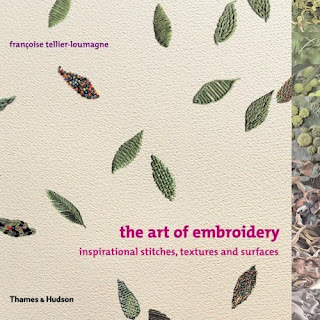 It has been around for a while but like the embroidery one, is a wonderfully inspirational book. Lots of lacey ideas which is what I have been thinking about for using on the embellisher. 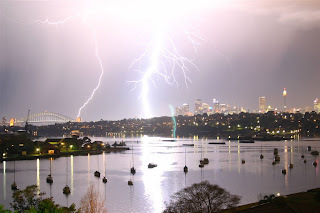 Jessica sent me this fabulous photo of a Sydney storm. Really spectacular isn't it? Breaking my heart today - one of our eucalyptus trees is being removed by the Tree Wise Men - has to happen as the brick fence is falling over. 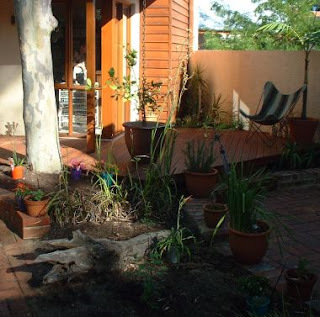 We shall replant with something shady but it takes a while. These trees we have are sooooo precious. Maggie Grey and Val Campbell-Harding's new book. Everyone keeps asking if we will be stocking it. I would dearly love to but sadly it is just too expensive for us to have. With the discount of around 2 pounds 80p and then with postage on top (and our credit card charges and subsidised postage to you from us in Australia), we would be paying you to buy it from us! So please just buy it directly from Maggie. She dispatches them very quickly believe you me. We had a lovely weekend in Hobart although I swear I took the heat with us - on Friday it was so hot and muggy. Trip was not without excitements but nothing like violin strings or fountain pens. Plane was 2 hours late leaving Perth so we missed our connection and got put on a very late Jetstar plane which seemed to be full of all the waifs and strays who had missed flights and we got to Hobart at 1am. Believe it or not we had a sleep in. Then Ian left his mobile in a restaurant down by the water and he had to walk back to get it. Today our 4.15am wakeup call got messed up and it came at 3.15am for a 6.15 plane which left late. So it makes a long day when you get back to Perth. Unpacked 2 suitcases with 2 to go so it's now all in reverse. Did half the orders but not the ones with the things in suitcases. I had a lovely embellisher workshop on Sunday (yesterday - it seems like a lifetime ago) and everyone did some great stuff. I hope they all enjoyed it too. No pics or a whiff of pics - the main computer is playing up and driving us nuts so it looks like a doctor call is necessary. It was lovely to see so many of our wonderful Tassie customers. Lots of you are just like friends as you have supported us since we began. Back to the book tomorrow - have an isbn and a bar code so it is getting there. I will also load my TAST tomorrow just in time to start the next one. And tragically, my beloved Hurricanes lost and are now floundering near the bottom of the ladder even with their 6 All Blacks back. 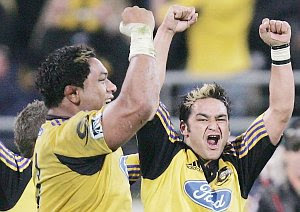 However, I am loyal and optimistic and am sure they will do much better next week back home in Wellington. Tonight we went to a great concert with the Australian Chamber Orchestra. Richard Tognetti was telling us about their week. The hall in Woollongong is to be demolished so they had to cancel, in Canberra they had to change venues and when they flew out of somewhere in Australia, the security people initially wouldn't let them take their string instruments on the plane because they might inflict damage with their strings. Makes some of our hassles pale into insignificance. Just have to share the new Opulent rayon threads - just enough time to do a stitchout. 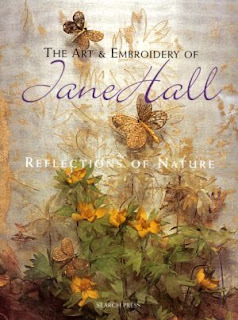 Wednesday has brought many excitements - first of all this gorgeous book from Jane Hall turned up. I have admired her work for a long time. Such ethereal stuff. I have grabbed one for myself and written my name inside so I can't sell it. Next, the Opulent threads have arrived and have been deposited at our lockup. We are going to go down after the mail has been done to open the boxes so I can start packaging them and stitching with them. And the two challenge winners for helping me name them will have their's sent tomorrow. I think I have been waiting in anticipation for far too long. I have finished the knitting and embellishing section of the book so skipping on to finish the next section - another little excitement. Last night we went to a whacky movie - Hot Fuzz - if you want a fun movie I would recommend it. Not sure if there was a message - just a laugh or many. It is nearly 36 here today (and we have people coming for a bbq - I am cooking Raan in the webber). Ian went off to get the heat beads and the car tyre shredded so the poor thing was out walking without his hat in the sweltering heat but fortunately he ran into an RAC man. Then I asked him to photograph my scroll which looks nothing (you need to turn your head on the side to see it) but I am pleased with it - lots of knitted slips and stuff and all with the embellisher including the beads. in fact I think it is one of the most interesting pieces I have done this while. I will forget how to use my sewing machine soon. Only joking - I am hanging in for the new rayon machine threads to arrive so I can play with them. I had a bit of trauma this week - I thought I had lost the two pieces I made for the AQC exhibition. I searched the house and the studio trying not to panic and sent Ian into the cellar to check out the suitcases. I thought I might have thrown them out with the rubbish. However, after 3 days of searching and wondering, I spotted some plastic sticking out from under the sofa and as I pulled a plastic bag out, I knew what it was. I was not intending to remake them, believe you me. 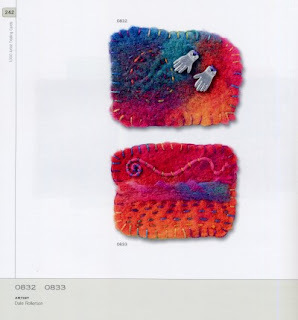 You can the front page of my little book on my embellishment blog. 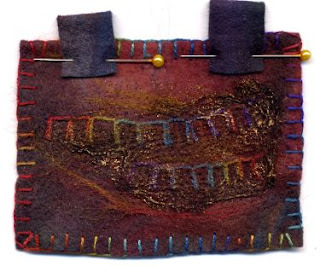 it's hard to imagine that this is the 11th week of TAST but here is my up and down buttonhole stitch sample - with some wool fibres and chiffon embellished over the top and treasure gold rubbed over. This is a minimilist page - part of a little book I am making - you can see the pins still in place. It has vin ordinaire buttonhole around the edges. it doesn't feel like Autumn especially not in the afternoons when the humidity is awful but I guess it is cooler in the morning. 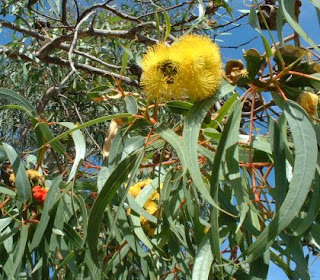 We are having to have one of our eucalyptus trees chopped down boo hoo but this one is in our front garden and leans over the fence. The little orangey/reddy cases pop off and the lovely yellow flowers pop out. The honeysuckles love it and there are lots of birds around in the mornings. Last night The Force won their game convincingly against the Reds who were woedful actually. Hurricanes are in South Africa so have to wait until the morning. I am working like fury on the knit and embellish section of teh book and you can see one of my efforts on my embellishment blog. Have also just finished a lovely little scroll. 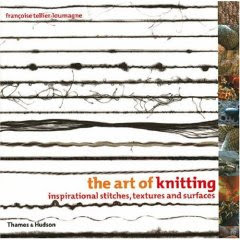 this is another of my very favourite books - different cover from mine but I pore through it all the time - such wonderful stuff for ideas and inspiration. I bought this book in London last year and had forgotten about it. 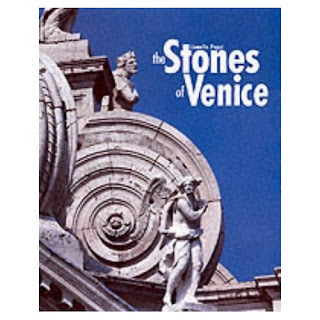 It is one the most inspriational books I have in my collection - not a technique book but more of an art book. Just to trigger the brain - quite organic really. Most of us don't need technique books - just lots of inspiration for when we have our dead days. what a day - we had the Sunday Times reporter and photographer here and before that Ian cleaned the windows and I finished cleaning up the studio - then we heaps of deliveries (not all unpacked yet) and lots of orders and physical customers. Tonight we also have visitors for a bbq. One box was full of Patricia Bolton's 1000 ATCs with 2 pages all to me. This is one of the pages. 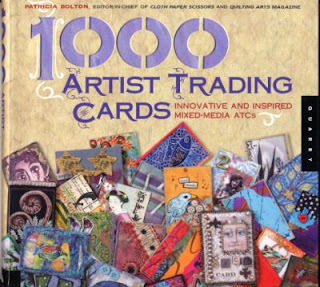 It's full of all manner of interesting ATCs with some well known names including some friends. There are just too many talented people out there. I haven't photographed my used melting pot yet but I will. 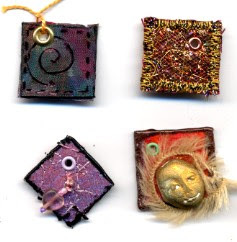 I also sent out nearly all of the ATCs from the Quilt Convention today. The last few will be posted tomorrow. Thanks so much to everyone who took part. It was the most fabulous display and enjoyed by so many visitors. 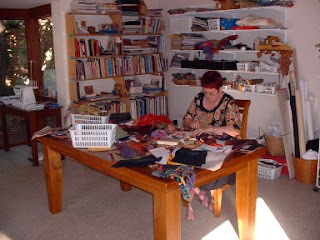 a terrible pic of me but I have moved the three sewing tables and the machines over into their own area. 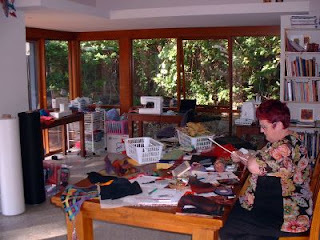 Great light for working - just a little hot in the late afternoon at present so sewing is best in the mornings. I am finishing a little bit of knitting to embellish. 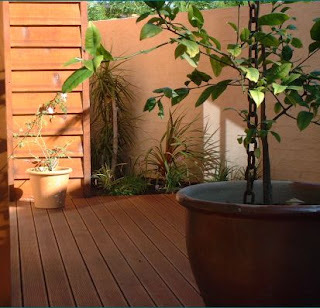 Here are 2 pics of the garden at the side of the studio. I just wanted to show how we have got that little triangle all nice and green and Ian is getting his light organised for nightime. That's our lemon tree with 7 lemons growing nicely. This is my effort for barbed chain stitch - I have renamed it as I kept reading it that way. The thread is my lovely new Arabian Nights - one of the new Opulent collection. They should start making their way onto the web catalogue soon. And if we are lucky the machine threads will arrive here towards the end of the week - they should have arrived at the wharf on Saturday. The pic should really be turned around but these barbs are lying on their back resting because I was late. More pics coming - the photographer for the SundayTimes coming tomorrow forced us into some action and I spent a lot of time putting the remainder of my stuff away in the studio and moving things around so I iwll take some pics of that, and we cleaned (well Ian dug and carted) two sections of the garden and I bought a pile of plants. Then we sat outside and enjoyed it. We have 2 big areas to do but will need a skip for that. I have had lots of emails this morning asking what a melting pot is. Here is mine before I used it yesterday - I have had it for quite some time. I turned it on, added UTEE and when it melted I dipped the charms in (couldn't find the tongs so used my fingers and only burnt them a little) - I also added some Opalettes as they have lovely colours and some sparkle. I couldn't find my gold UTEE so I used bronze and it needed a tiny lift. I shall improve! 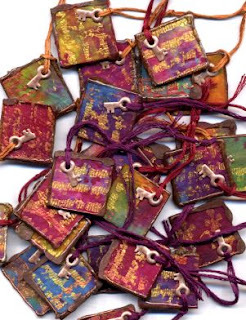 These are my fabric charms to send off on Monday - with a medieval theme. 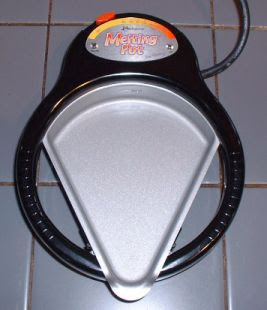 I have to make an admission that this is the first time I have used my melting pot and I am amazed at myself - it was so easy and convenient and why haven't I used it earlier - time probably. However I intend to continue with it so you can expect to see little molten edges for a while. The studio is pretty chaotic with 2 tables inside - one waiting to come back into the office so I have somewhere to put my business stuff instead of on the floor. On Monday a lot of goodies will move back into the house temporarily for the photo session on Tuesday not to mention the rapid garden development in at least one section. The rugby was very exciting last night with the Force winning their first at home game. So for that to happen the Hurricanes had to lose - talk about tension at the end. See if Ian's team wins this afternoon. The 22 All Black players join their teams again on Monday - that will be interesting. The weather is more condusive to my knitting today so happy to keep on with it. Packed the palette of stuff to send to Tasmania today and I have organised for 2 embellishers to use in my workshop. Looking forward to it. The weather has cooled down thank goodness, probably because there is a cyclone up north - it is pretty windy. Lots of dust around because the bulldozer has been cleaning up in the building site next door. I have been knitting with mohair and wool for the embellisher - not the right weather but gotta do it. Also made my 24 fabric charms to send off on Monday - I will post a pic or two tomorrow. And I have to try this barred chain stitch - I thought it said barbed chain stitch. Not in any of my books. Off to watch my beloved Hurricanes play the Force tonight. Fingers crossed as always. 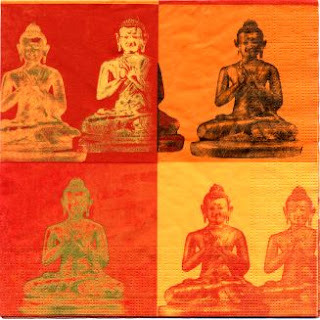 I got 4 more 2" x 2" fabric in the post today and another one attached to a lovely postcard. I am about to start my 24 to get them aaway by the end of the week. There really are some fabulous swaps going on. Margaret asked how one can work when it is over 42 degrees. One can't - we have spent today wading through our back log of orders and have nearly cleared the decks (down to 4 big ones to do in the morning before it starts again) but even with air con you only work at half pace. I got up well before 6am and had to go out to a supplier at one stage and to our warehouse but them crept back indoors again. Thank goodness for air cons. ATCs - the stuff from Melbourne has just arrived and I am in the process of emptying the boxes and when I find the ATCs I shall be sending them on to their new owners. They were really all so wonderful. When I have the boxes empty I have to fill them up again to send the palett of stuff to Tasmania on Friday. It never rains but it pours. Wish it was actually. One shoudl never wear white. It doesn't even suit me - I bought a top but after today's painting, I have lovely little red dots all over my top. Relegated to the old clothes dept already. Tonight we are off to our local to eat - it is too hot to cook we reckon. 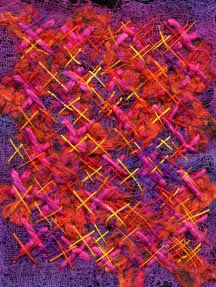 Here is my last week's effort of Cross Stitch - you can't really see it but I knitted some yarn and embellished it, cut it into strips and embellished it onto scrim and felt in a cross then stitched over the top of it with various thicknesses of silk yarn. Wonder what the next stitch is? 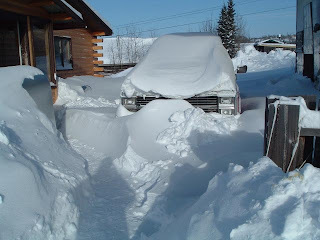 By the way it was 40 degrees here today and 42 predicted for tomorrow - Autumn? 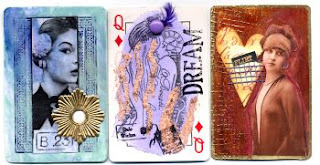 At the Art Retreat a number of people were trading ATCs and even though I didn't have any, I scored these three. Three full on workshops in three days is what you might call exhausting, especially when you are teaching in a room without windows and not much ventilation with all the mixed media stuff I had. But the classes went well and the participants were great. 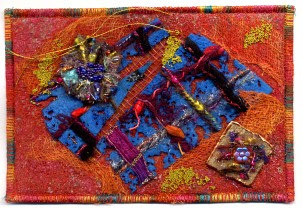 That's the last mixed media workshops I shall be doing for ages - at least this year. Back to the embellisher. I took my embellisher with me and let them all play and they had a great time. For non stitchy people it is so easy. Had trouble dragging a few away. 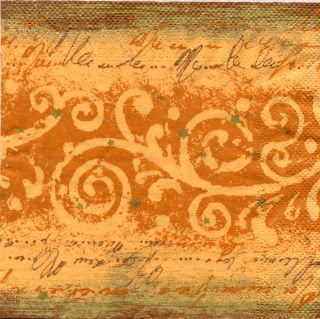 Debbie Baker gave me these wonderful paper napkins at the Art Retreat - she was in my class Frescoes and Fragments and aren't they great? When I have recovered I shall be using them for sure. I spent today cleaning up my stuff and making my studio look more ready for work than it did over the weekend. I have my new big table up there and will move out my temporary one tomorrow. Also did some of my TAST sample which I will load later on. Debbie reminded me about the challenge I posted some time back. I will be emailing all the people who emailed me in the next week. Not that I should be thinking about it as I am back to the book - knitting and embellishing section now to finish. Have not allowed myself to think more over the weekend - only whilst driving to and from Fremantle. I would hope that if those who asked are interestd, that we would start sometime in April. This morning I had a sleep in although I woke at 6am as normal and had coffee in bed. Then Ian rushed to the shops to buy eggs and mushrooms so I could make omelettes for breakfast but he did bring back some lovely red roses as well. Next weekend we have to do some gardening and cleaning studio windows etc (not to mention what I have to do inside) as the Sunday Times people are coming on Tuesday to photograph for an article. Lots of orders to start my day tomorrow - a sort of stock pile - our usual speedy service is a little behind but the specials are up almost at the beginning of the month. Haven't any pics to show - I have just run two workshops at the Art Retreat in Fremantle - I have had 2 lovely little classes - Crusty Vessels and Medieval Magic - and they all created some great stuff. Tomorrow is Frescoes and Fragments and I will be ready for a Monday sleep in althoujh I am busting to get back to the embellisher. I have taken mine to the workshops and people have been having wonderful fun exploring it. I won't have my TAST ready until Monday either - just in time to start the next one!